PURCHASE YOUR OYSTER ROAST TICKETS HERE! –Inviting friends and family to Airlie to enjoy an oyster feast along the banks of Bradley Creek is a tradition rooted in Airlie’s history. Beginning around 1905, The Joneses hosted extravagant oyster roasts on the property. Guests came from far and near to enjoy the warm southern climate and celebrate a local delicacy. This tradition was revived in 2000, after Airlie opened to the public, and has become our most important annual fundraising event. 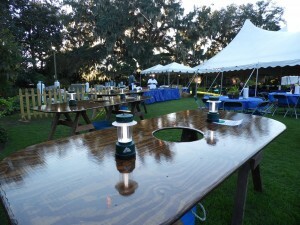 Proceeds from this event support Airlie’s Environmental Education Programs*, which is fitting, since the oyster plays such a strong role in our coastal eco-system.